1972 agus é mar aidhm aige?Pobal a thógáil le Gaeilge?. Reachtáileadh iliomad imeachtaí le dha scór bliain anuas dírithe ar idir óg agus aosta.Ón mbliain 1980 i leith reachtáiltear Éigse Chluain Tarbh ?féile pobail seachtaine- ina mbíonn eagrais eile pobail páirteach. Tá nasc dlúth ag Pobal Chluian Tarbh lenár gcomheagras Gaeilge ? Briathar Beo?-atá ag reachtáil ranganna Gaeilge seachtainiúla le sé bliana déag anuas; le grúpa macarónach Clasach de Comhaltas Ceoltóirí Éireann agus le raidio pobail ?Near F.M?, ina nglactar páirt I gcláracha éagsúla ó am go chéile. Tá Pobal Chluian Tarbh an-mhórálach as na húdair Gaeilge ón gceantar. Is liosta le háireamh iad agus tá fiontar idir lámha faoi láthair lena saol agus a saothar a chur ar phár. 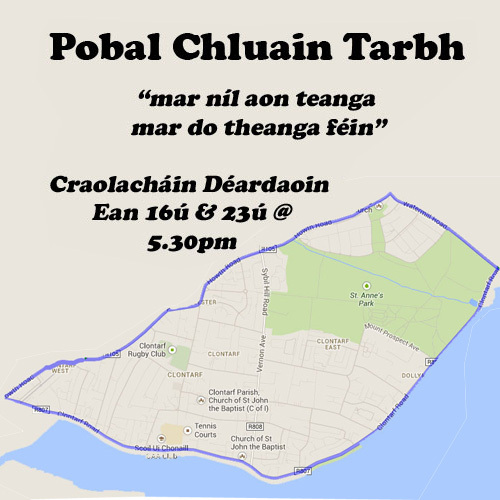 Pobal Chluian Tarbh is an Irish volunteer community which has been in existence since 1972 and aims to “build a community language “. They have held numerous events over the past two decades aimed at young and older people. Since 1980 they have run Clontarf Poetry Festival – a community week, involving other community organisations. 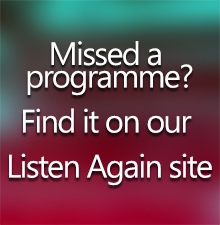 Briathar Beo” – holding language classes weekly for the last sixteen years ; Comhaltas – a group of traditional Irish musicians doing Macaronic singing; and Near FM – a community radio station, where we occasionally participate in different programs. Pobal Chluian Tarbh is very proud of the Irish authors from the area . A venture is underway to create a list of authors and have their lives and works put to paper.